She’s lyrical; she swings; she has deep feeling and a light heart. He’s versatile, a wonderful mix of elegance and roistering. Marc’s a hero of mine: listen and be moved. Dawn will be appearing with swing / blues guitar master Larry Scala at the Jazz Jubilee by the Sea in Pismo, California (October 25-28); Marc will be there as well with High Sierra, the Creole Syncopaters, and who knows where Dawn, he, and Larry will turn up? Conal, Dawn, and Marc will again appear as the Dawn Lambeth Trio at the San Diego Jazz Fest, which takes place over Thanksgiving weekend in that welcoming city, and Conal will be an integral part of the Yerba Buena Stompers there as well. Posted in "Thanks A Million", Bliss!, Hotter Than That, Ideal Places, It's All True, Jazz Titans, Pay Attention!, Swing You Cats!, That Was Fun!, The Heroes Among Us, The Real Thing, The Things We Love, Wow! “DINAH LOU,” music by Rube Bloom and lyrics by Ted Koehler, from the 29th COTTON CLUB PARADE, perhaps would have gotten less attention and affection if it had not been the subject of several memorable recordings. A footnote: the song was composed several years earlier, and recorded by Red Nichols (leading an expert but little-known post-Pennies Chicago band) at the end of 1932: I hope to share that disc in a future posting. On January 20, 1936, Ivie Anderson sang it with the Duke Ellington Orchestra (three takes, of which two survive). I don’t know which of these two was recorded first, but I’ve distinguished them by sound and length. Talk about wonderful instrumental voices — in addition to Ivie, whom no one’s equalled. The motive behind this leisurely long satisfying performance may have been nothing more complex than “Let’s stretch out and keep taking solos,” but it works so splendidly: hearing this is like watching two marvelous tennis players volley for hours with the ball always in the air. It feels very much like a magical return to a late-Thirties Basie aesthetic, with none of the usual patterns of an opening ensemble giving way, after the horn solos, to rhythm section solos. Will anyone adopt DINAH LOU as a good tune to improvise on in this century? The late Leroy “Sam” Parkins used to say of very special music that it got him “right in the gizzard.” Since I am not a chicken, I have serious doubts that I have a gizzard or where it might be located, but I know when music “gets” me, because I want to hear and see it over and over. Here are three wonderful performances by the singer Dawn Giblin, pianist James Dapogny, and cellist Mike Karoub — recorded splendidly by JAZZ LIVES’ Michigan bureau chief Laura Wyman of Wyman Video on May 7, 2017. I don’t have the requisite adjectives — all exuberant — to describe the sounds of the Dawn Giblin Trio at Cliff Bell’s . . . but this is a gorgeously intuitive and swinging chamber trio that gets to the heart of the music from the first note. Professor Dapogny and Maestro Karoub are masters of swing and feeling: warmth and swing invented on the spot, and Dawn both reassures and surprises with each phrase. Experience these wonders for yourself. Your gizzard will thank you. The shifting densities of Dawn’s voice — emphasis without overkill, hints of gospel, blues, and folk — are delicious. A beautiful tempo and small homages to Teddy Wilson from Professor Dapogny and that most beautiful sound, Maestro Karoub’s singing cello. Finally, the Romberg – Hammerstein classic LOVER, COME BACK TO ME — a performance that would make indoor plants shoot up in rhythmic joy. While you’re musing over this, consider how we can have many CDs by the Dawn Giblin Trio in exactly this formulation. It’s a dream of mine. And gratitude a-plenty not only to the musicians, but to Laura Wyman for her very fine video work. The bespectacled fellow was only a name in a discography to me until today. According to the Discography of American Recordings entry here, this performance was recorded on November 25, 1929, in New York City. The composers of this thin but irresistible song (with a rising chromatic motif and unadventurous lyrics) are Arnold Johnson (music) — who may have been the bandleader known to some for his associations with Jack Purvis and Harold Arlen — and Charles Newman (lyrics). Newman is better known for the lyrics of SWEETHEARTS ON PARADE, I’LL NEVER HAVE TO DREAM AGAIN, WHAT’S THE USE, I WOULDN’T CHANGE YOU FOR THE WORLD, YOU’VE GOT ME CRYING AGAIN, I’M PAINTING THE TOWN RED, TAKE ANOTHER GUESS, WHY DON’T WE DO THIS MORE OFTEN? (a song I learned through the recording Melissa Collard and Eddie Erickson made of it) and the imperishable A HOT DOG, A BLANKET, AND YOU. Apparently Newman took current conversational phrases and bent them into songs — songs more memorable for their performers. A month and a day before this recording, the stock market had crashed: was that one of many reasons for this song? The record of copyright notes that HOLLYWOOD is dated November 9 — slightly over two weeks after the crash, which may be even more significant. Gillham is a pleasant singer, even with wobbly vibrato. Radio audiences and song publishers must have loved him, because every word came through. But I am particularly interested in the little band: muted trumpet or cornet, bright and agile clarinet, sweet violin, Gillham’s own piano, perhaps someone at a drum set, although aside from one resonant thump at 1:25, it’s hard to tell. (Was it multi-tasking Eddie King or Justin Ring?) I believe that “novelty” came from the presence of horns, rather than a more “legitimate” polite accompaniment by piano or piano and violin. But this record has not been annotated or noticed by the official jazz scholars. A selection from Gillham’s recordings makes its way into the discographies I have (Rust and Lord) — because those sessions feature Red Nichols, Miff Mole, Rube Bloom, Louis Hooper, Murray Kellner, Andy Sanella. The three or four sides concluding either discography [thus defined as jazz recordings] have him accompanied by Alex Hill on piano, and Gillham performs Hill’s YOU WERE ONLY PASSING TIME WITH ME. The lack of documentation of HOLLYWOOD — which sounds like a certifiable “jazz record” — says much more about the “star system” in jazz than it does about the lightly swinging instrumental music heard here. The players do not sound like those stars most featured and idolized: not Mannie Klein or Jack Purvis or Nichols, not Jimmy Dorsey or Tesch, Joe Venuti, or Stan King. But the music is memorable, inventive and rhythmic, and I would rather have this record, offered as an anonymous effort, than a dozen others with more famous names that might have satisfied less. Once again we encounter rewarding art that no one has designated as such. Posted in "Thanks A Million", Bliss!, Generosities, It's A Mystery, It's All True, Pay Attention!, Swing You Cats!, That Was Fun!, The Heroes Among Us, The Real Thing, The Things We Love, Wow! At the most recent (November 2013) San Diego Jazz Fest, a friend introduced a smiling woman to me with these words, “Michael, this is Vonne. Her father was Tommy Thunen.” I was very excited, and told Vonne so, for I knew her father’s name for years: as the second or third trumpet player on many Red Nichols recordings. She was happy that I was so excited, and she promised to send more about her father. 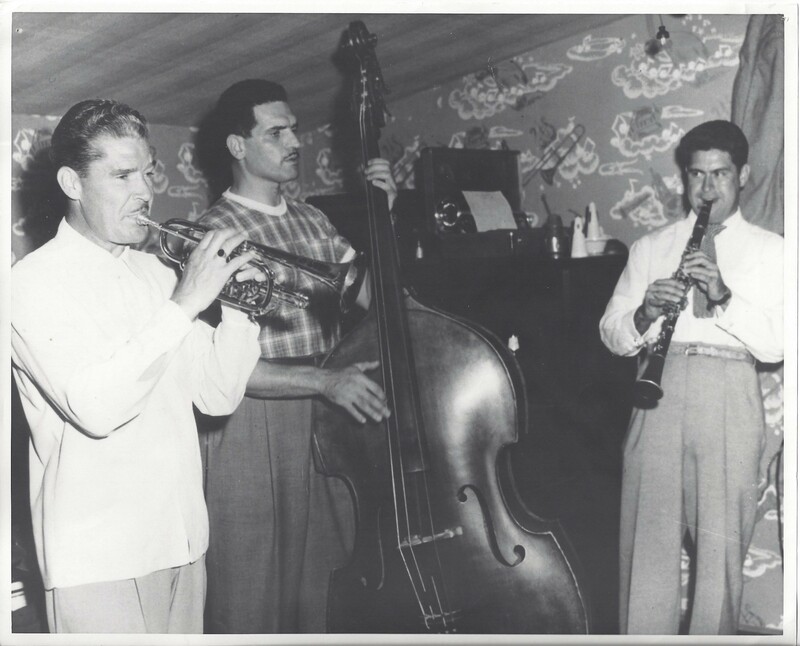 My dad, Tommy Thunen, played with Red Nichols, Paul Whiteman, and later Russ Morgan. As you probably know, Russ Morgan played at the Claremont Hotel in Berkeley for a number of years. 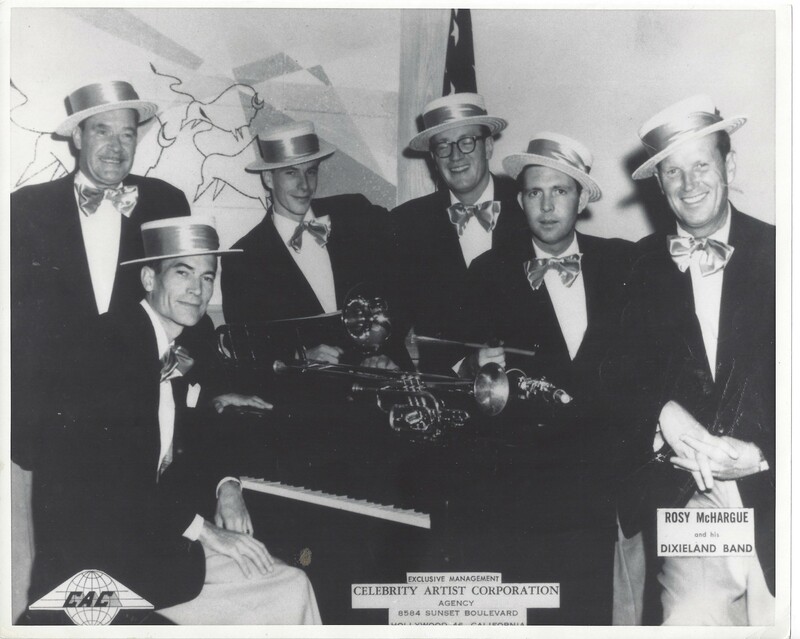 My dad played with Abe Lyman’s Orchestra in the 30’s I believe. He also played on two radio programs in New York. One was called “Waltz Time” on Friday nights and the other was “Manhattan Merry-Go-Round” on Sundays. I believe it was one of the major radio stations in New York. 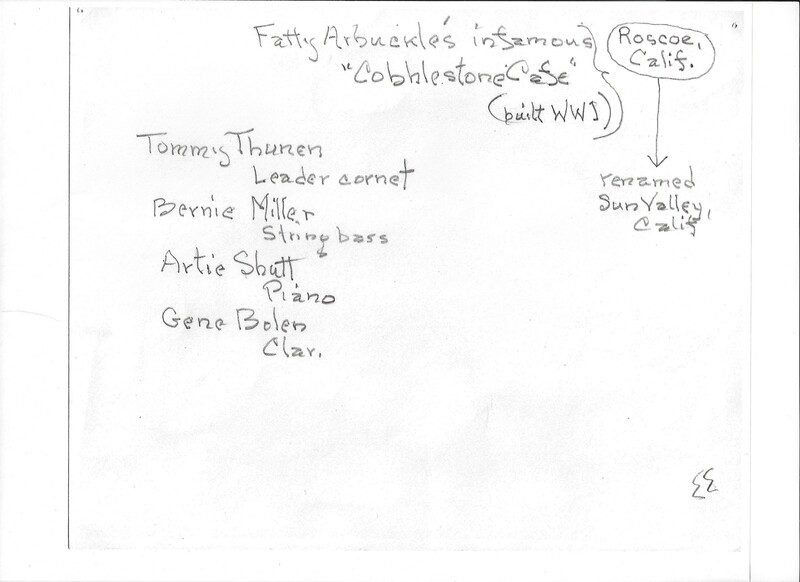 In later years he was living in San Fernando Valley and played with a band led by Rosy McHargue at a place called The Cobblestone, and he also played with Rosy in Las Vegas. Musicians have told me that he had a “sweet” sound. He also played cornet and alto sax. One of his first “gigs” was at age 13 when he played at an Armistice parade at the end of the first World War. 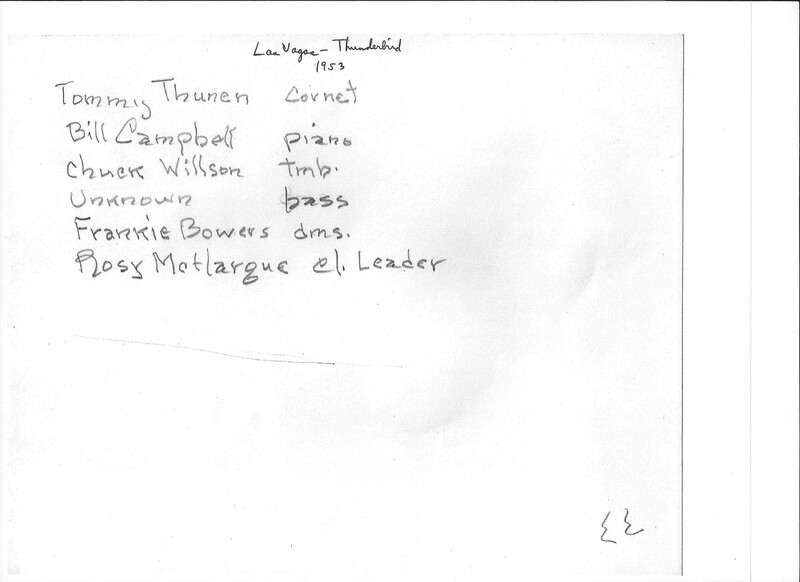 My own investigation into Tommy’s recorded work as documented in the “jazz” records to be found in Tom Lord’s discography shows him to be a New York regular who traveled in fast company: not only with Nichols, but the Irving Mills recording groups that used men out of the Ben Pollack Orchestra, starting in 1929. 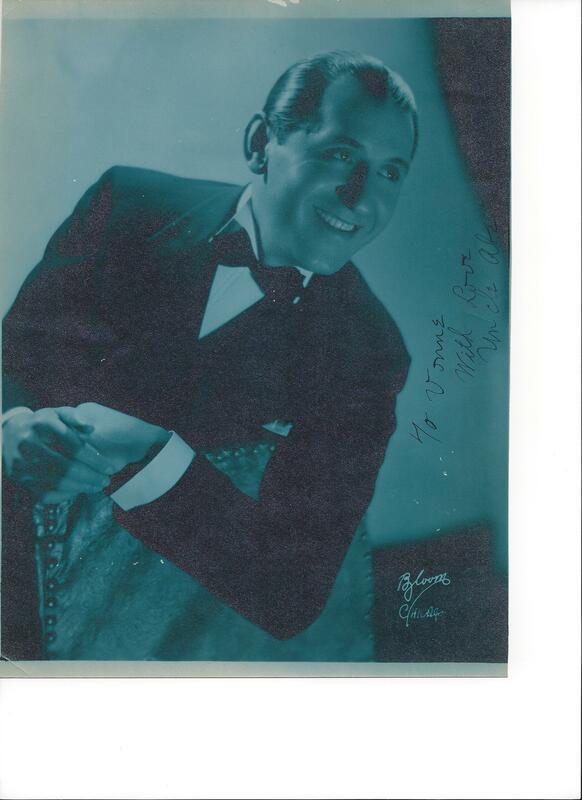 Tommy played alongside Gene Krupa, Jimmy McPartland, Jack Teagarden, Benny Goodman, Jimmy Dorsey, Larry Binyon, Ray Bauduc, Bud Freeman, Joe Sullivan, Eddie Condon, Mannie Klein, Dave Tough, Red McKenzie, Pee Wee Russell, Fud Livingston, Glenn Miller, Irving Brodsky, Joe Tarto, Mickey Bloom, Rube Bloom, Babe Russin, Adrian Rollini, Tommy Dorsey, Tony Parenti, Annette Hanshaw, Eddie Miller, and other New York Reliables — all of this in 1929-30. He surfaces again on some hot recordings by the Abe Lyman band in 1933, and then not again until working with Rosy McHargue in 1957, and — fittingly — he is the sole trumpet, out in the open, on his final recordings with Jack Teagarden in Jack’s Sextet that same year: the soundtrack from a television program, a July appearance at the Newport Jazz Festival, and a promotional record of the Marlboro cigarette jingle in September — alongside Jerry Fuller, Don Ewell, Stan Puls, and Monte Mountjoy. Other recordings on YouTube might have Tommy in the personnel: a search will turn up some lovely music from Annette Hanshaw, among others. But now for the photographs! 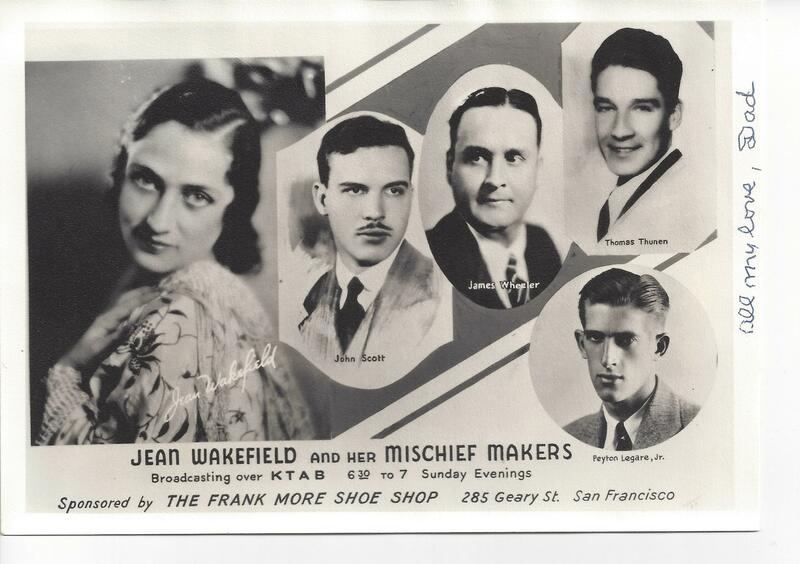 All I know about mischievous Jean is she and the Makers are listed in the radio section of the Berkeley, California, Daily Gazette for Saturday, November 7, 1931, broadcasting over KLX at 7 PM. (Airchecks, anyone?) To me, the most important part of that photograph is the inscription on the left. I haven’t found any reference to the Cobblestone Cafe, although I don’t have a biography of Arbuckle at hand. He was dead in mid-1933 and this photograph is from some decades later. Aside from Tommy, the most famous musician, pianist Arthur Schutt, who lived until 1965, is hidden from view. Clarinetist Gene Bolen, however, recorded from the late Fifties onwards, so I await informed speculations about a more precise dating. I hope we will find out more about the life and music of Tommy Thunen, not only from his daughter. But the music we hold dear is not simply a matter of famous soloists and stars, the people about whom biographies are written, but of reliable professionals whose names aren’t famous, indispensable craftspeople nevertheless. These quiet men and women might appear predictably bourgeois, not exciting. But any communal art form — be it jazz, the symphony, or the theatre — needs people one can count on to be on time, well-prepared, clean, sober, expert. After the fact, people tell tales of the brilliant musician who is also unpredictable — but such artists are at best hard on everyone’s nervous system. But we are more intrigued by Jack Purvis or Charlie Parker than Mannie Klein or Hilton Jefferson. How many beautiful players were there who did their work superbly but never got interviewed, whose names were known only to fellow musicians and discographers . . . who made the whole enterprise of music go on as it did? I’d like to see books called THE JAZZ PROFESSIONALS — consider among thousands Harold Baker, Buster Bailey, Murray McEachern, Helen Humes and Nick Fatool — people who didn’t lead bands or win Metronome polls, but who were the very foundation of what we take for granted. And Tommy Thunen, about whom we now know a little more, thanks to his daughter. The 2012 Whitley Bay Classic Jazz Party opened — not with a bang but with a rag. This set, led by the elegantly risque Keith Nichols (piano, vocals, commentary) featured Emma Fisk (violin), Norman Field (reeds), Martin Wheatley (banjo/ guitar), and Frans Sjostrom (bass saxophone) in a program that roved about in the first thirty years of the last century. The Classic Jazz Party is like no other — a living, energized jazz museum with plenty of room for blowing and smiles all around. Here’s the first cheerful offering of a long rollicking musical weekend. A short commercial interlude: the 2012 Party was sold out — dramatically early. The 2013 Party (Friday November 1 – Sunday November 3, with a pre-party concert on October 31) has already begun to fill up. Click here for details. It promises to be thoroughly gratifying. I’ve tried fish oil capsules and probiotics, saw palmetto and niacin, magnesium and multivitamins, goldenseal and Bach flower remedies. But nothing gives me the lift of a Reynolds Brothers set — and one with Clint Baker (trombone, clarinet, occasional vocal) is even more potent. 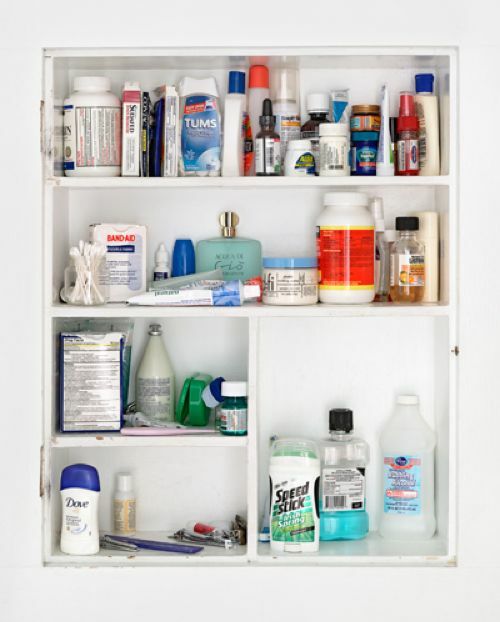 Take as directed: like homeopathy, the smallest dosage is transformative. The RB are, as always, Ralf (washboard); John (guitar, whistling); Marc Caparone (cornet); Katie Cavera (string bass) — all four have been known to break into song when the moment is ripe. See for yourself in this delightful long set recorded at the 2012 Sacramento Music Festival (at the Railroad Museum on May 27, 2012, for the record-keepers).